Serving Pink Lemonade: LOVE this cake! It's black berry season. I couldn't believe it when I was at the store the other day and they were selling for 50 cents a pack. I loaded up my cart with plans to freeze some, use some for snacking and others for some of my favorite blackberry recipes. Beat pudding mix and milk with whisk in medium bowl 2 min. Stir in 1 cup cool whip. Stack cake layers on plate, filling each layer with half each of the remaining berries and pudding mixture. Top with remaining cool whip and reserved berries. Refrigerate 4 hours. 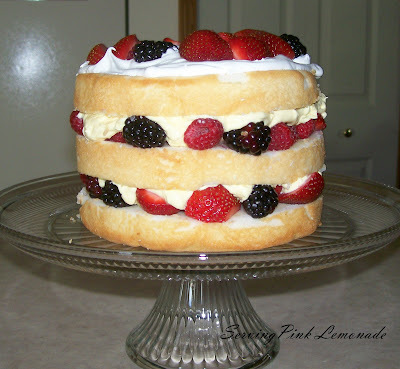 HERE is another one of my favorite blackberry recipes. 50 cents. Are you kidding me? I live on the east coast. Beach. A tiny container about 12 blackberries in it sells for 3.99 ON SALE. Just wanted you to know that I passed the Versatile Blogger award on to YOU! DELISH! Looks like I'll have to make this too! You say you love this cake ... all I can say to that is: me too!